Type: BOOKS. Detail: Pritchett, C. Product Code: 9781857446715. 'Chess Secrets' is a series of books which uncover the mysteries of the most important aspects of chess, such as strategy, attack, defence, opening play, endgames, offboard preparation and mental attitude. In each book the author chooses and deeply studies a number of great players who have excelled in such aspects of the game, greatly influenced their peers and inspired all of us. 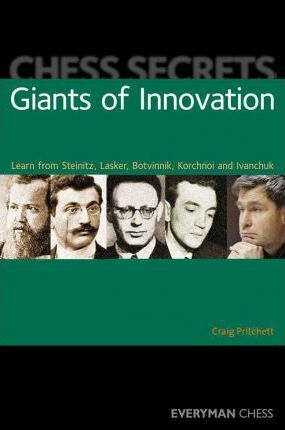 In 'Giants of Innovation', Craig Pritchett selects five chess legends whose play exemplifies outstandingly innovative attributes. Wilhelm Steinitz established the essential groundrules for modern positional chess. Emanuel Lasker pioneered a new kind of totalA", allout battling chess. Mikhail Botvinnik taught us how to prepare and successfully play an entire range of complex modern opening systems. Viktor Korchnoi set particularly high standards in the art of defence and counterattack. Vassily Ivanchuk, a modern byword for ingenuity and surprise, excels by constant creation. Read this book and enhance your own skills. Understand how to inject more innovation into your own games. Softback, 288 pages.